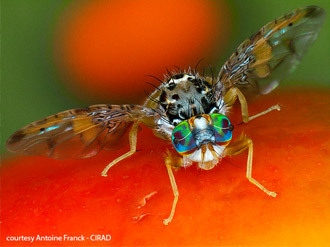 Fruit flies belong to a large family of flies called Tephritidae, and a number of them cause considerable damage to crops. In Africa, the cultivation of fruit and vegetables is greatly hampered by these insect pests. Before research and pest control programs can be established, the correct identification of pest species is necessary. Such identification is based on the use of traditional dichotomous identification keys, also known as 'single-access' keys (two choices for each identification step). However, the technical specific terminology used in these keys is a stumbling block for non-specialists who are unfamiliar with the morphology and taxonomy of fruit flies. Moreover, when these keys are used, identification fails when users cannot respond to a question in the key (because they lack the needed taxonomic expertise, or the key is not clear enough, or the specimen is damaged, etc.). For this reason, Massimiliano Virgilio, Ian White and Marc De Meyer have developed the first 'multi-entry' key for African fruit flies. Instead of using one character at a time, anywhere from 11 to 95 characters (wing venation, shape or size of antennae, etc.) can be used to identify a specimen. 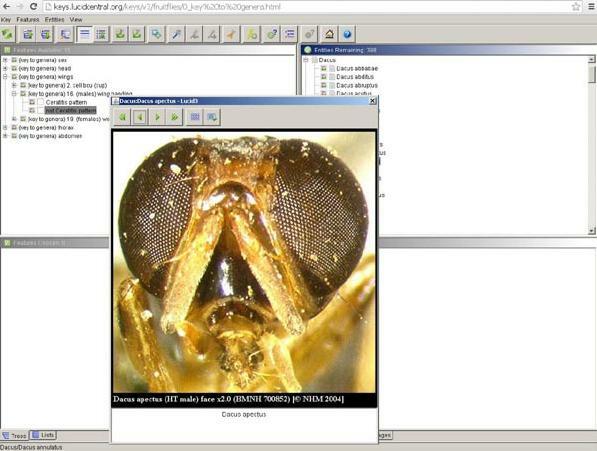 The identification key can be used online or downloaded for free (about 350 MB). Important: if your computer runs a recent version of the Java Virtual Machine, its default settings could prevent you to view the Applet. Please go to this page to view a tutorial about modifying your Java settings by adding an exception for this site. It can also be requested from Massimiliano Virgilio or Marc De Meyer.